Man is the greatest of all of God's creatures.He is so endowed and empowered. Of the greatest of all the many blessings bestowed on us by God is our ability to alter the course of our lives though the power of choice. I will consider this power of choice from the perspectives of BE-DO-HAVE Philosophy of personal development. want to be in the future! God has given man the power to influence this amongst all odds through the power of choice. He just has not become it yet! We can choose to be and to become that which we desire. Having been and done all within his powers man creates and avenue for himself to have all that comes with it. to him having the object of his desires. 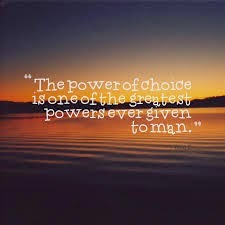 The power of choice is a two-edged sword,which can be used to set about either a positive or negative result. It is within your power to choose your outcome in every event and even when the outcome is not desirable it has been created by choice either consciously or consciously.